nance prompts households to move toward self-employment. Such movement does not take place at a time. Rather, access to credit of the poor households initially brings the non-productive household members into productive sector, mainly in self-employment activity. Such opportunity creates new income opportunity in relative to wage income. The returns to self employment than attract the households to be solely self employed in the long run to receive the windfall gain from self-employment activity. The poor continue to be poor, and the gap between the rich and the poor widens at very alarming rates. The children of the influential, wealth-amassing and greedy few that are in authority have their future by oppression and injustice. Not that the poor man's child is not intelligent, and not that they cannot work, do they continue to remain stagnant economically. The real cause is that while every effort and penny is expended to ensure that the poor man's child is given a future, the opposing forces of oppression and injustice are beyond the mere effort that the poor parent can put in. They do not have legal representation and so many are the cases decided against them. They do not have the political connections that the greedy few have, and so they cannot get the smallest of contracts even through the much-sung about ‘transparent system of public tenders.' They cannot acquire land at a fair price because land deals are controlled by political cadres. This question is important because an increase in production of any crop over time stems from three possible sources: yield increases, increased area planted, and increased ratio of harvested to planted area. In Zambia's case the changes in the ratio of harvested to planted area between 2009/10 and 2010/11 has accounted for 28% of the growth in maize production compared to the prior 3 year period. Understanding how to manage the constraints in the graphic above becomes vital. The latest FSRP policy synthesis suggests the need for "more effective extension of moisture conserving and flood protecting agronomic practices to farmers may substantially promote maize production and yields in Zambia". 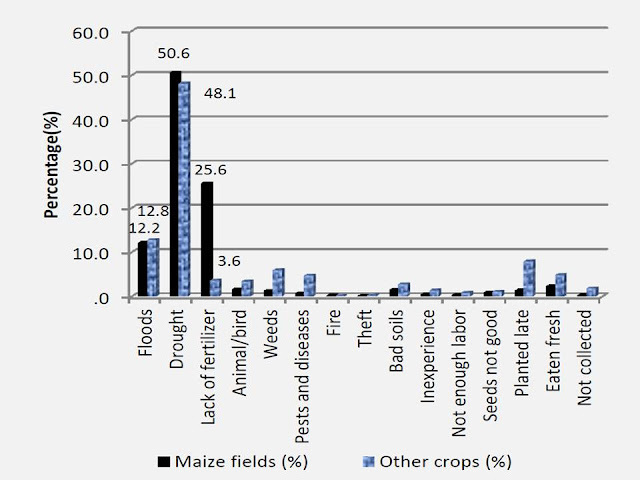 For a useful insights regarding Zambia's maize policy challenges see the latest ACF-FSRP-MACO presentation - Zambia's Maize Policy Challenges : Issues and Options. Zambian women have the same rights as men, and running for political office is not an exception. When I took over as minister of finance....Zambia was at its lowest. I remember there was a day when I was required to effect payment for half a million dollars and the government did not have any money. We had to borrow from one of our commercial banks. We were trying to liberalise the economy but we had no income in the country. I was privileged to be one of those who managed to push through the structural adjustment programme. Liberia has had the best leader (President Ellen Johnson Sirleaf) post conflict to manage that economy. And it is not just about the economy, but people’s attitudes as well. I believe that if Africa believed that one of its major assets is women, we would be much better. Look at what is happening in Libya, Somalia and all the carnage… who is making those decisions? The motherly instinct of a woman would not allow such, as mothers our stomachs move when we see such carnage. I believe that with women in charge, we would not be seeing most of the conflicts we are seeing in Africa today. But, is Nawakwi right? Does female political leadership lead to superior economic outcomes? Is there any reason why we think female leadership may have a positive macroeconomic impact on Zambia? Are there any fundamental different in public policies that men and women may pursue and how would that affect national outcomes? Firstly, it is important to note that despite all the successes of China’s SEZs in providing incentives for investments and fostering growth, it has created a vast disparity in levels of development between coastal areas and the interior. The problem of ‘enclave economies’ is pronounced in countries where economic growth is weak outside of the export hubs. If the Zambian state merely collects rents, then, as Leonard and Strauss have pointed out, production will remain “disconnected from the overall productivity of the overall population…thus making the general health of areas outside of the enclave quite secondary”. Utilisation of SEZs needs therefore to be part of a much wider development strategy by the Zambian government if maximum utility is to be made from foreign direct investments. The efficacy of SEZs largely depends on the ability and the will of a government to distribute the proceeds of growth from these areas outwards. Global demand for copper is expected to remain strong. Long-term forecasts are by nature uncertain, but global demand for copper is expected to grow at around 3 percent annually, reaching 25 million tonnes by 2020. Much of the increase in demand will be driven by economic growth and urbanization in emerging economies, especially China and India. Over time, advanced economies will need to invest in human capital, skills and social safety nets to increase productivity and enable workers to compete, be flexible and thrive in a globalized economy. The alternative is – like in the 1930s - unending stagnation, depression, currency and trade wars, capital controls, financial crisis, sovereign insolvencies, and massive social and political instability. As every A-level economics student knows the role of government is to minimise market failures, whilst minimising institutional distortions in policy design. This simple rule always gets us away from ideology and back to basic economics. The government will always have a role to play in shaping markets because it is ontologically prior to the market. The challenge for the policy maker is to identify where government adds real value - very few would disagree that the areas identified by Roubin conform to basic economic steer, namely genuinely public good provision , fostering competition and ensuring long term stability through tackling inequality. You can read more Roubin via Project Syndicate. Rural poverty is increasing. The growth trajectory, while respectable, is not sufficient to reach the government’s objective of achieving middle-income status by 2030. There is an urgent need to increase the productivity of both the formal and informal sectors. Why does this situation persist? Political economists point to many contributing factors: the rent-seeking behavior typical of many land-locked countries rich in natural resources; the legacy of socialism that encouraged over-reliance on the state as the engine of employment and economic growth; the volatility associated with reliance on a single commodity market; high poverty levels; and the lack of a civic voice, especially among the rural poor. Zambia manifests some key features of what has been described as a Limited Access Order (LAO). In the LAO, elites trade economic rents for political support; hence they tend to resist reforms that could detract from their financial and political dominance. To the extent that this is true, then Zambia would seem to be caught in a vicious circle. Rents are important (due to the importance of the mining industry and aggravated by the fact that the country is landlocked), and the lack of economic/trade diversification allows capture and rent-seeking behavior to prosper. This phenomenon perpetuates the status quo (wherein many sectors seem to be captured by monopolies or cartels), which, in turn, limits productivity, economic diversification, and the formation of new businesses. This assessment of course is in line with our previous assessment that economic outcomes are fundamentally about allocation of political and economic power. To the extent that people in power have no incentive to change the distribution of political power, they will continue to pursue economic policies that keeps them dominant politically. For example, they will seek to control loss making media houses; maintain parastatals as cash cows at the expense of genuine competition; pander to foreign corporations at the expense of locals because such firms finance their campaigns; and, only undertake development when they are politically vulnerable. In short, its not that policy makers are ignorant about the necessary solutions to move Zambia forward, rather there's an inherent lack of will on their part (incentives) to pursue that which they know is in the interests of the greater majority. We are poor because our poverty serves the elites that rule Zambia. NAREP has released its draft manifesto and wants your comments. You can leave them below and we will forward them to NAREP. Alternatively you can email them directly : info@newzambia.org A quick skim suggests this is the most clearest manifesto yet - clear in its intent and most importantly early thinking on funding arrangement. Allowing people to comment also ensures its genuinely "people driven". A manifesto must be owned by the people. Well worth the read. We will review it alongside other manifestos. As passenger numbers increase the use of ageing airport infrastructure can distort the dynamic working balance required for modern and efficient airport operations. These factors have catalysed the most significant regeneration of Zambia’s main commercial airports. Ambitious plans have been set in motion to develop a sophisticated airport system in Zambia replacing the colonial infrastructure that is now constrained and outdated. The welcoming committee watched in horror as their "liberators" drove the refugees off the boat, made them kneel on the embankment with their hands behind their heads, and executed over a hundred of them. Many were bludgeoned to death with rifle butts or clubs. A local priest saw AFDL [Kabila's army] soldiers kills an infant by beating its head against a concrete wall. In Mbandaka and another nearby town, Red Cross workers buried some nine hundred bodies. "The alliance fighters told us they only killed former soldiers guilty of mudering many Tutsi people in Rwanda", a Red Cross worker told another journalist. "Yet with my own hands I buried small children whose heads were crushed by rifle butts. Buried those poor little ones and women, too". Excerpt from Dancing in the Glory of Monsters : The Collapse of the Congo and the Great War of Africa (Jason Sterns). Currently reading this new release (May 2011). The above quote recalls the horror of Kabila's advance backed by Kagame and Museveni's forces, which left carnage along the way. More quotes to come as I work my way through. Not literally "flying", but thats the facetious name for the use of plastic bags for defecation, which are then thrown into ditches, on the roadside, or simply as far away as possible. A recent IRIN report paints the deplorable picture in our nation. Corruption and lack of funding have undermined the push for adequate drainage systems, leading to situation where contact with human excreta in dense settlement is order of the day. The other point of course is these again are issues that immediately impacts on the most vulnerable (children, women, etc). We have touched on this issue before (see here and here). Statistics on rural - urban access to health facilities can be found here. Charity Muyumbana, 45, has spent her entire adult life contending with recurrent flooding, poor drainage, and a lack of toilets in Kanyama, the sprawling Lusaka township where she lives. “Most of the people use plastic bags to relieve themselves during the night. They find it more convenient because some toilets are up to 200m away from the house,” she told IRIN. For developing countries, the manufacturing imperative is nothing less than vital. Typically, the productivity gap with the rest of the economy is much wider. When manufacturing takes off, it can generate millions of jobs for unskilled workers, often women, who previously were employed in traditional agriculture or petty services. Industrialization was the driving force of rapid growth in southern Europe during the 1950’s and 1960’s, and in East and Southeast Asia since the 1960’s. India, which has recently experienced Chinese rates of growth, has bucked the trend by relying on software, call centers, and other business services. This has led some to think that India (and perhaps others) can take a different, service-led path to growth. But the weakness of manufacturing is a drag on India’s overall economic performance and threatens the sustainability of its growth. India’s high-productivity service industries employ workers who are at the very top end of the education distribution. Ultimately, the Indian economy will have to generate productive jobs for the low-skilled workers with which it is abundantly endowed. Much of that employment will need to come from manufacturing. For developing countries, expanding manufacturing industries enables not only improved resource allocation, but also dynamic gains over time. This is because most manufacturing industries are what might be called “escalator activities”: once an economy gets a toehold in an industry, productivity tends to rise rapidly towards that industry’s technology frontier. Manufacturing of course is a vital part of the diversification, something that Zambia has lamentably failed to achieve thus far, largely due to the inability to find sufficient revenues to aid the transformation process. A UNIFEF video presentation on the role cash transfers are playing in Zambia to provide social protection to vulnerable families. Some of the examples given are interesting (education, health) but the jury is still out whether cash transfers can lead to sustained escape from poverty. More discussion on this here and here. How does MNCs' corruption affect developing countries? "Multinational corporations’ corrupt practices affect the South (i.e. Africa, Asia and Latin America) in many ways. They undermine development and exacerbate inequality and poverty. They disadvantage smaller domestic firms and transfer money that could be put towards poverty eradication into the hands of the rich. They distort decision-making in favour of projects that benefit the few rather than the many. They also increase debt that benefit the company, not the country; bypass local democratic processes; damage the environment; circumvent legislation; and promote weapons sales. Bribes put up the prices of projects. When these projects are paid for with money borrowed internationally, bribery adds to a country's external debt. Ordinary people end up paying this back through cuts in spending on health, education and public services. Often they also have to pay by shouldering the long-term burdens of projects that do not benefit them and which they never requested". Susan Hawley (Corner House, 2000) as quoted by Lord Aikins Adusei. Democratic accountability can be further impaired when domestic NGOs line up support from international NGOs, which are usually less well-informed about local trade-offs but are financially and organizationally much stronger. There have been some cases where democratically elected local governments have been thwarted from constructing dams that would have provided irrigation for many small farmers. The activist opponents of the dams, taking up the cause of the displaced, mobilized their international anti-dam fraternity to protest at World Bank headquarters and with US Congressmen, compelling the World Bank president to cancel the previously promised large loans for dam construction without allowing for adequate hearing from the small farmers who might have benefited. Whether the dams should have been constructed is not the point. The issue is one of democratic accountability. From a fascinating piece by Pranab Bardhan on the limits of NGOs in fostering global development. It is certainly true that there's a tendency by some people to treat Civil Society Organisations (CSOs) as a panacea for development. The answer to every problem appears to be "we need more CSO participartion". The truth is that whilst on average CSOs have been force for positive social and economic change, they have sometimes been instruments of state oppression and corrupt plunder. Indeed the problem we face in Zambia is how to distinguish a genuine CSO from an artificial one. Many corrupt governments have realized that where CSOs are against their political objectives, the logical approach is simply to create another CSO that is more favourable to its position (usually with grand and contradictory names e.g Forum for Leadership Search). How often does one read of a so-called NGO backing a clearly foolish proposal ? So, not only do highly reputable NGOs suffer from weaknesses, but we find that many of CSOs are pseudo organisations purposely created to widen the democratic deficit in society. Unfortunately, in an effort to hold legitimate organisations to account we face a problem of identification. As the country is preparing for the September 2011 elections, JCTR urges all political parties and electorates to focus on issues that will enhance the quality of living of every Zambian, especially the poor. According to the Jesuit Centre for Theological Reflection (JCTR), a faith based organisation that promotes social justice, “it is imperative that the campaigns and subsequent parliamentary and presidential elections be based on improving household living conditions”. Of utmost importance are the issues relating to availability and accessibility of adequate nutrition and quality social services to the majority of Zambians. A new FSRP paper presents fresh evidence on the state of rural poverty in Zambia. It draws on longitudinal data collected from 4,286 households which participated in three nationwide surveys conducted over seven years, in 2001, 2004, and 2008, to examine the factors associated with chronic and transient poverty and use the results to draw implications for designing policies and programs for alleviating rural poverty and promoting income growth for rural Zambia households. The analysis shows that the number of poor rural households went up by about 1%, from 88.7% to 89.6%. The authors conclude that, "the results indicate the challenges that Zambia faces in her poverty reduction quest recording very minimal poverty reduction over the seven years period". Income inequality also remains very high in Zambia. Levels of inequality remains very high, with the Gini coefficient, having increased from 0.64 in 2001 and 2004 to 0.67 in 2008. The conclusion is inescapable, "the gains from general economic growth in the country are not helping close the inequality gap. If these findings are corroborated by other studies then they have very important policy implications. The question remains, what kind of investments are required to close the inequality gap and raise the majority of rural Zambians out of poverty". Poland based economist Richard Mbewe recently recollected a grave tale of his recent foray into Zambia alongside his research colleague, when their valuables (laptops, etc) were stolen whilst staying at Fairview Hotel (please avoid at all costs). Never mind that he had been away for some time and was happy to be back whilst conducting important research that would contribute to the nation's body of knowledge. As shocking as the theft was, it was his observation of his dealings with the police that grabbed my attention. Repeatedly, the police came across as chaotic and under-resource, most typified by the curious problem of "having no transport" at critical moments - relying on the "victims" to offer transport. Richard's experience came to mind as I read two stories that demonstrates the on-going transport problems among the police which has made them subservient to the public (and thereby breeding corruption). Mongolian policy makers have created a “human development fund” in large part through prepaid taxes from foreign investors in the Oyu Tolgoi mine, and it doles out 21,000 tugriks ($17) to every Mongolian once a month. Government negotiators are also demanding that the foreign companies that will develop the Tavan Tolgoi mine, which holds an estimated 6.4 billion metric tons of coal, pay their taxes early. Plans call for listing shares of the project in London or Hong Kong, then granting 10 percent of them to the Mongolian people, making every citizen a shareholder. From a fascinating article - Foreign Money Invades Mongolia. As we have previously noted, a precondition for these innovative models is that you actually have money. Zambia at present cannot afford $17 monthly payments per person for its mineral wealth because that would demand it collects atleast $2.7bn per year in mineral royalty taxes. As we have noted, it only collected $52m in 2009 from an industry making over $5bn that year. We touch on these issues in our latest essay - Debunking the Government's Case for Low Mining Taxation in Zambia. Zambian Economist wishes to express its full and sincere apologies for the offence caused by the comments of some of our readership on an article published on 20 August 2010 titled "Impersonating Economists". Though the blog post did not mention Mr Kanyama (nor was it about him), subsequent readers' comments were disparaging to him and caused offence. The relevant article has now been deleted. We have apologised to Mr Kanyama directly and accepted our responsibility to always ensure that both articles we publish and comments made by our readership are not insulting. We are thankful to Mr Kanyama for accepting our apologies. There is more to the question of unemployment than just its economic and social costs, severe as they are in our country at present. Even if unemployment did not impact negatively on the economy, and even if it was not a cause of many of our social problems, it would still be a denial of an essential element of human dignity. Through work, we cooperate with the creator in bringing to fulfillment the created world; we exercise our God-given abilities and talents as co-workers with God in the great task of transforming the material world. Work is not simply an honorous necessity, coincidental with our physical existence, a burden which we should try to escape. It is a vital part of our humanity, the manifestation of our creativity, an opportunity for our growth and fulfillment. Indeed, work is nothing less than a constituent dimension of the purpose for which the world was created and for which we ourselves were brought into being. That so many of our people are denied the opportunity to work is a shameful injustice, especially since it is to a large extent the result of excessive pursuit of economic policies which fail to take adequate account of the inherent value and dignity of the human person. Work is indeed a right, a right which, as a nation, we fail to respect at our peril. The depth of thought constructed here is something I have not read in any Zambian editorial before. There are several deep ideas here. I like that they recognise justice is grounded in "human worth". This of course is my own conception of justice as expounded by Nicholas Wolterstorff. It is also good that they have noted the creation mandate of man in "the great task of transforming the material world". This gives purpose to our work. Without God at the centre of our economic activities, it is all meaningless and purposeless. The only bit that is unclear is the conclusion. If work is a right, we must surely ask what sort of right is it? One would think they regard it as a "conferred right" based on their appeal to the UN, but then they employ "inherent rights" arguments which ground justice in human worth. So one concludes they employment as an "inherent right". But of what sort? "permissive rights" or "claim rights"? A human right? I don't think having a job is a claim right (something we are "naturally" entitled to) but we have a right to having the right to a job. It is the infringement of the right to having the right to a job, that is the problem not the inability to work. With that resolved, it also becomes clear that having a job can never be a human right because having a job is a permissive right - a right we can claim we are permitted to. At best therefore it is conferred. Important electoral data from the Electoral Commission of Zambia data by constituency and age (2011). We have uploaded it here. Useful information to putting together projections. Huge thanks to a good friend, who made this available to us. The ECZ has useful past voting patterns which can help with the calibration of forecasts. As the ECZ has not yet published this 2011 data on their website, and we have got it through non-official channels, it should naturally be treated with caution. We hope this will change as soon as possible.